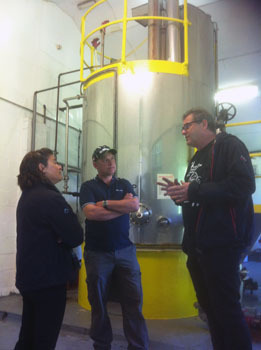 Dawn Repetto at Bushy's Isle of Man Brewery discusses plans for an 'Island Brew', infused with Tristan Island Berries. 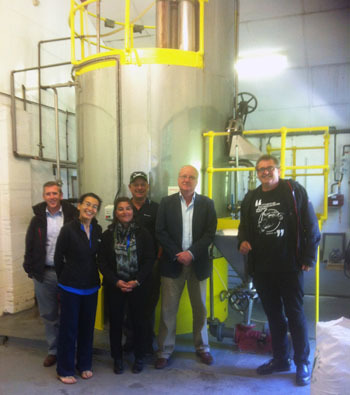 Dawn with her husband Robin Repetto with Bushy's Martin Brunnschweiler discussing the forthcoming brew Tristan Administrator Alex Mitham, Hasene Mitham, Dawn Repetto, Robin Repetto, Tristan Government UK Representative Chris Carnegy and Martin Brunnschweiler from Bushy's Brewery. "Island Brew" has its origins in a meeting called by the Foreign and Commonwealth Office in Whitehall after a Joint Ministerial Council, to discuss with Chief Islander, Ian Lavarello, the Chief Ministers of the other UK Overseas Territories and their British counterparts, ways of increasing prosperity through developing local resources. However, last year former Tristan UK Representative, Chris Bates, was in Gibraltar on behalf of Tristan's Postmistress Iris Green at an international philatelic conference and discovered beer on sale there, brewed on the Isle of Man using Gibraltar-grown hops. Recalling he'd enjoyed on a Manx holiday Bushy's Bramble Beer (which is infused with Manx grown blackberries) he approached Martin Brunnschweiler, founder of the island's Bushy's Brewery to suggest a beer with Tristan ingredients. His response was immediate and positive and Tristan islanders set about picking the berries for Dawn and Robin to take with them.